Chimeratech Fortress Dragon and a broken-apart Cyber Dragon appear in this card's artwork. This card seems to depict the assembly of Cyber Dragon Nova. The Spanish print of this card has a small typo, as it says 1 of these effect instead of 1 of these effects"". The "● Target 1 LIGHT Machine-Type monster in your Graveyard; shuffle that target into the Deck." targets 1 LIGHT Machine-Type monster in your Graveyard. You choose 1 of the "●" when this card is activated. If you choose "● Target 1 LIGHT Machine-Type monster in your Graveyard; shuffle that target into the Deck. ", then you must also target 1 LIGHT Machine-Type monster in your Graveyard. If this card is activated by selecting both "●" effects and a LIGHT Machine-Type monster is no longer in your Deck when the card resolves, then the "● Add 1 LIGHT Machine-Type monster from your Deck to your hand." effect cannot be applied, but the "● Target 1 LIGHT Machine-Type monster in your Graveyard; shuffle that target into the Deck." effect will resolve normally. Also, if the targeted monster is no longer in the Graveyard when the card resolves, then the "● Target 1 LIGHT Machine-Type monster in your Graveyard; shuffle that target into the Deck." effect cannot be applied, but the "● Add 1 LIGHT Machine-Type monster from your Deck to your hand." effect will resolve normally. (In this case, adding a card to your hand will be considered the last thing to happen.). : If "Cyber Repair Plant" is activated by selecting both effects, but when the card resolves, either the targeted monster is no longer in the Graveyard, or there is no longer a LIGHT Machine-Type monster in my Deck, how does "Cyber Repair Plant" resolve? If this card is activated by selecting both "●" effects, then the "● Add 1 LIGHT Machine-Type monster from your Deck to your hand." effect is resolved first. The "● Target 1 LIGHT Machine-Type monster in your Graveyard; shuffle that target into the Deck." effect cannot be resolved first. Also, if this card is activated by selecting both "●" effects, then the "●" effects do not resolve simultaneously. (In this case, shuffling the targeted monster into the Deck will be considered the last thing to happen. ): If "Cyber Repair Plant" is activated by selecting both effects, how do I resolve each one? If this card is activated by selecting both "●" effects, even if the number of "Cyber Dragon" in the Graveyard becomes less than 3 when the card resolves, this card will resolve normally, and you will be able to apply both "●" effects. However, if "D.D. Crow" banishes the "Cyber Dragon" that was targeted with the "● Target 1 LIGHT Machine-Type monster in your Graveyard; shuffle that target into the Deck." effect, then you will only be able to resolve the "● Add 1 LIGHT Machine-Type monster from your Deck to your hand." effect. (In this case, adding a card to your hand will be considered the last thing to happen. 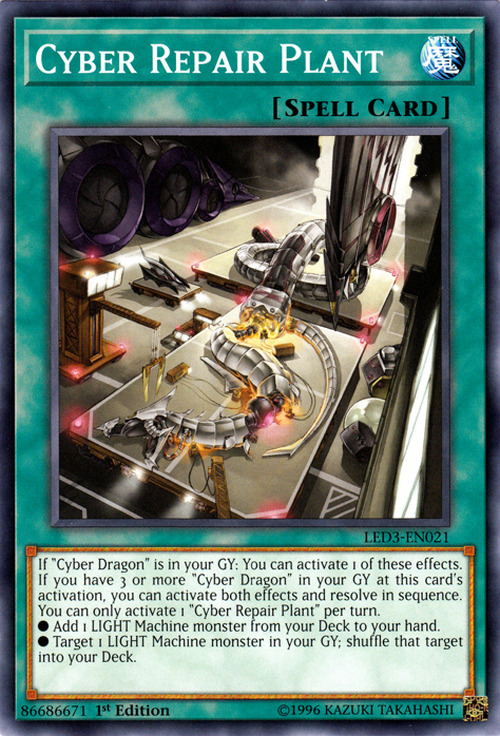 ): If "Cyber Repair Plant" is activated by selecting both effects and when the card resolves, the number of "Cyber Dragon" in the Graveyard becomes less than 3, how does "Cyber Repair Plant" resolve?